On January 19, 1968 President Johnson announced his selection of Clark M. Clifford as McNamara's successor. Clifford was born in Fort Scott, Kansas, on December 25, 1906, took both bachelor and law degrees at Washington University, and practiced law in St. Louis between 1928 and 1943. He served as an officer with the Navy from 1944 to 1946, including assignment as assistant naval aide and naval aide to the president. After separation from the Navy, he held the position of special counsel to the president from 1946 to 1950. During this period he participated extensively in the legislative efforts that resulted in the National Security Act of 1947 and its 1949 amendments. After leaving the government in 1950 Clifford practiced law in Washington, but continued to advise the White House occasionally. In 1960 he was a member of President-elect Kennedy's Committee on the Defense Establishment, headed by Stuart Symington. In May 1961 Kennedy appointed him to the President's Foreign Intelligence Advisory Board, which he chaired beginning in April 1963. After President Johnson entered office, Clifford served frequently as an unofficial counselor and sometimes undertook short-term official duties, including a trip with General Maxwell Taylor in 1967 to Vietnam and other countries in Southeast Asia and the Pacific. Clifford estimated that in the year prior to his appointment as secretary of defense he had spent about half of his time advising the president and the other half with his law firm. Widely known and respected in Washington and knowledgeable on defense matters when he became secretary of defense on 1 March 1968, Clifford was generally hailed as a worthy successor to McNamara. Many regarded the new secretary as more of a hawk on Vietnam than McNamara and thought his selection might presage an escalation of the U.S. military effort there. Clifford attempted to allay such fears when, responding to a query on whether he was a hawk or dove, he remarked, "I am not conscious of falling under any of those ornithological divisions." Vietnam occupied most of Clifford's time and attention during his less than 11 months in office. He did not change the management system McNamara installed at the Pentagon, and for the most part assigned internal administration to Deputy Secretary of Defense Paul H. Nitze. Clifford made no effort to depart from McNamara's policies and programs on such matters as nuclear strategy, NATO, and military assistance, but he favored the Sentinel ABM system McNamara gave only lukewarm backing. He wanted to deploy the system and supported congressional appropriations for it. One important effect of Sentinel construction, he thought, would be to encourage the Soviet Union to enter arms control talks with the United States. Indeed, before Clifford left office, the Johnson administration made arrangements for negotiations that eventually led to the ABM limitation treaty in 1972. Clifford continued McNamara's highly publicized Cost Reduction Program, announcing that over $1.2 billion had been saved in FY 1968 as a result of the effort. Faced with a congressionally mandated reduction of expenditures in FY 1969, Clifford suspended the planned activation of an infantry division and deactivated 50 small ships, 9 naval air squadrons, and 23 Nike-Hercules launch sites. By the time Clifford became secretary, DoD work on the FY 1969 budget was complete. It amounted in total obligational authority to $77.7 billion, almost $3 billion more than in FY 1968. The final FY 1970 budget, which Clifford and his staff worked on before they left office, amounted to $75.5 billion TOA. Clifford took office committed to continuing the president's Vietnam policies. At his nomination hearing, he told the Senate Armed Services Committee that the limited objective of the United States was to guarantee to the South Vietnamese people the right of self-determination. He opposed ending the U.S. bombing of North Vietnam but acknowledged that the situation could change. In fact, on 31 March 1968, just a month after Clifford arrived at the Pentagon, President Johnson, in an effort to get peace talks started, ordered the cessation of bombing north of the 20th parallel, an area comprising almost 80 percent of North Vietnam's land area and 90 percent of its population. In the same address, Johnson announced that he would not be a candidate for reelection in 1968. Soon the North Vietnamese agreed to negotiations, which began in Paris in mid-May 1968. Later, on 31 October 1968, to encourage the successful outcome of these talks, the president, with Clifford's strong support, ordered an end to all bombing in North Vietnam. Clifford, like McNamara, had to deal with frequent requests for additional troops from military commanders in Vietnam. When he became secretary, the authorized force in Vietnam was 525,000. At the end of March 1968 the president agreed to send 24,500 more troops on an emergency basis, raising authorized strength to 549,500, a figure never reached. Even as he oversaw a continued buildup, Clifford preferred to emphasize the points President Johnson had made in his 31 March address: that the South Vietnamese army could take over a greater share of the fighting, that the administration would place an absolute limit on the number of U.S. troops in Vietnam, and that it would take steps, including the bombing restrictions, to reduce the combat level. Eventually Clifford moved very close, with the president's tacit support, to the position McNamara held on Vietnam just before he left office‹no further increases in U.S. troop levels, support for the bombing halt, and gradual disengagement from the conflict. By this time Clifford clearly disagreed with Secretary of State Dean Rusk, who believed, according to the Washington Post, "that the war was being won by the allies" and that it "would be won if America had the will to win it." After he left office, Clifford, in the July 1969 issue of Foreign Affairs, made his views crystal clear: "Nothing we might do could be so beneficial . . . as to begin to withdraw our combat troops. Moreover . . . we cannot realistically expect to achieve anything more through our military force, and the time has come to begin to disengage. That was my final conclusion as I left the Pentagon on January 20, 1969." Although the Johnson administration ended under the cloud of the Vietnam War, Clifford concluded his short term as secretary of defense with his reputation probably enhanced. He got along well with Congress, and this helped him to secure approval of at least some of his program. Besides settling in to his duties quickly and efficiently, Clifford capably managed the initial de-escalation of U.S. involvement in the Vietnam conflict; indeed, he apparently strongly influenced the president in favor of the de-escalation strategy. 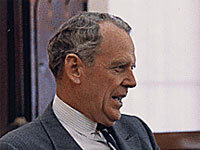 As he left office to return to his law practice in Washington, Clifford expressed the hope and expectation that international tension would abate, citing the shift in the Vietnam confrontation from the battlefield to the conference table and the evident willingness of the Soviet Union to discuss limitations on strategic nuclear weapons.